You’re surprised at all the blood. He looks over at you, eyes wide, mouth dropping open, his face almost as white as his shirt. He’s surprised, too. 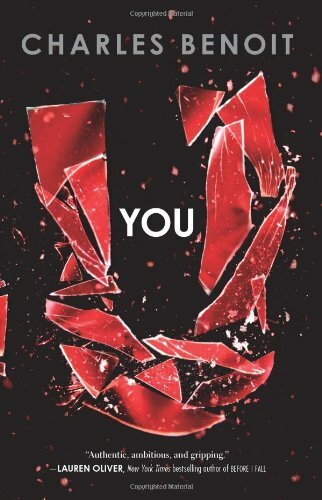 You is basically the tale of your average, below-average high school kid — getting into trouble and checking out of school. Needing a friend and longing for a girl, Kyle finds the first in Zack — a new kid with a compelling style — who promises the second with his assistance. Zack seems to have everyone in the palm of his hand, and what looks to Kyle as a way forward turns into a darker path. This riveting book feels as realistic in its high school world, and yet is as dramatic enough to just about make your head spin off in its quick twists and warped turns. I can’t help but love You. This is one of my book club boys all time favorites (he's 12, read it on break). He _loved_ it, we ordered it for the library. I have not read it read, but will as soon as it arrives. I remain conflicted about second person, but curious, too, and will definitely check this out. I use it in picture books, though. And Mary Karr used it in one of her memoirs.Who am I to argue with her??? The second person POV took some getting used to, but I was completely absorbed by the end of the book. It turned out to be effective, and fortunately the book was short :-) Great read--different and engaging! I heard an interview on NPR recently with Mark Richard, an adult writer, recently (and, yep, male) who had used second person in Prayer House No. 2. He said that using second person had allowed him to talk about personal stuff he otherwise might not have been able to talk about, because it made him more ... I'm pretty sure the word he used was "objective," but I might be wrong. Will have to go back and listen again. Or. Wait. Maybe he was saying he'd written in 3rd person because he felt better about revealing things that way. (It was an autobiography.) Never mind! hmm not sure this one is for me. What's with all the blood? And, yeah, I think the second person can grate after a while. I've heard mixed reviews on this one. Knowing that you loved it may put it back on my TBR!